You may recall from last year's post, How to train for a healthy heart, that February is heart month. I provided a high intensity interval training (HIIT) workout that was an effective exercise for maintaining heart health. While HIIT style workouts are a great option, this year I want to revisit the basics -- defining what heart exercise actually is, the important factors you need to know and how you can incorporate this type of exercise into your routine. For your heart to truly reap the benefits of aerobic exercise you must move your whole body for a minimum of 10 minutes at a time, ideally 30 minutes a day, equaling a total of 150 minutes per week. 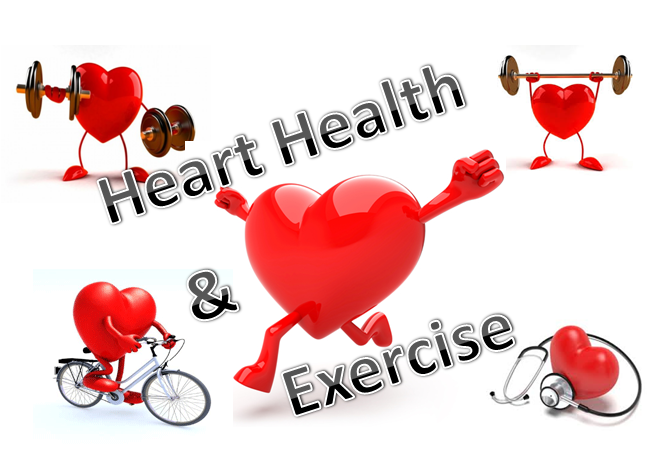 The key to maintaining good heart health is that you are partaking in aerobic exercise long enough, you're working hard enough and you're doing it consistently enough. According to the Heart and Stroke Foundation heart disease affects 1.3 million Canadians. Body fat percentage (BF%) - this is the measure of adipose (fat) tissue within the body. It's measured as a percentage and in managing your BF% you want to stay within the normal, healthy range; 18-24% (average) for men and 24-30 % (average) for women. Resting heart rate (RHR) - this is the number of times your heart beats per minute while at complete rest. RHR will decrease as your heart becomes stronger and a low resting heart rate is an indicator of a healthy heart. Blood pressure (BP) - the strength of your blood pushing against your vessels as it moves through the circulatory system. If your BP is too high it puts extra strain on your arteries and your heart. A healthy blood pressure measurement for adults is 120/80. Cholesterol - is a type of fat found in your blood. Cholesterol is a waxy, fat-like substance that is important for cell function but when 'good' called HDL and 'bad' called LDL cholesterol levels are out of balance you are at risk. Ask your doctor for your numbers. Training heart rate (THR) - The range that defines the upper and lower limits of your ideal training zone. Take 220 and minus your age, then multiple by .60 (lower range) and .80 (upper range). When you exercise aim to work within this training zone to reap cardiovascular fitness benefits. Knowledge is power, the more you know about yourself and your health the better equipped you are to do what is necessary -- either continuing down a healthy path or adjusting your lifestyle to make necessary changes. In order to properly monitor your numbers you need to utilize the tools you have access to. Whether this means regular checkups with your doctor, using your gyms scales or blood pressure monitors or investing in a heartrate monitoring device such as the MYZONE, which can measure your heart rate with up to 99.4 percent EKG accuracy. Know what options are available to you and use them to your advantage. You literally can walk off heart disease -- every step you take you're on your way to better heart health. No matter your fitness level, you can walk. If you're starting out, walk briskly for a minute then slow for the next minute and continue with this alteration for up to 30 minutes; or to start just walk what you can. You will build your endurance with every walk you take until you are able to power walk for 30 sustainable minutes minimum. When you find an activity that you like to do you are more likely to actually do it. So find a sport or Group Fitness Class that you enjoy and incorporate this into your weekly routine. Whether it's swimming, spinning, dancing, skating or something else that will get you moving and your blood pumping your heart will benefit. During these activities you can challenge yourself to make it a workout. For instance, if you enjoy skiing challenge yourself to ski the longer and tougher runs. Strength training is good for your muscles and, as you know, your heart is a muscle. When you lift weights you use whole body movements and your heart rate goes up. A great option when lifting weights is to create a strength circuit -- moving at a quick pace with little recovery time. Note, lifting weights will not create the same direct results for the heart as aerobic exercise but it's still a great option to add into your routine and effective for managing stress (which in itself is key to having a healthy heart). Try re-visiting the basics for a healthy heart -- it's all it takes to show your heart some love.